Muppets Most Wanted is an exceedingly amiable smilefest from start to finish, but it very well might be more entertaining for adults than children. With the Muppets finally reunited, it’s time for them to figure out their next move, to get their act together, pun completely and utterly intended. Enter Dominic Badguy (Ricky Gervais, Ghost Town), a talent agent who claims to have the likes of U2, One Direction and Rihanna clamoring for his services. With a surname like Badguy, it’s not giving away much to say it’s all a ruse and he’s in cahoots with the world’s most dangerous frog, Constantine. Dominic proposes a grand European tour to put the Muppets back in the spotlight in a very big way. Kermit has his doubts, but peer pressure gets the best of him and off they go. In keeping with all things Muppet, every situation is ripe for some sort of joke. Plot twists are called out for what they are, other moments are unabashed set ups for singing and dancing. And the songs here are at turns genuine and downright funny. In particular, a duet between Miss Piggy and Celine Dion is a triumph of self-parody - but it’s also a good song. 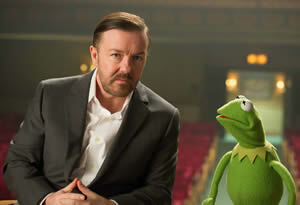 One of the hallmarks of The Muppet Show TV series was its ability to attract the A-listers of the time. That tradition continues here in spades. In addition to Dion, cameos include Salma Hayek, Christoph Waltz, Tony Bennett, Lady Gaga, Josh Groban, Sean Combs, Usher, Stanley Tucci, Tom Hiddleston and oodles more. A watchful eye will find Chloe Grace Moretz and James McAvoy in the mix. Those are the cameos. In addition to Gervais, the Muppets’ co-stars include Tina Fey, Ray Liotta, Ty Burrell and, perhaps least likely of all, Danny Trejo. Muppets Most Wanted overflows with old-school sensibilities and, honestly, it’s refreshing to watch the Muppets in fine form once again. Early on, there’s a joke about how the show should teach people life lessons, something about sharing or taking turns or the number “3.” Little subtle bits of humor like that sit comfortably side-by-side with the broader strokes of the star-studded humor. And, yeah, along the way there’s a message about friendship and loyalty. Constantine, who’s escaped from a Siberian gulag, and Dominic are on a mission to steal England’s Crown Jewels. Putting the Muppets on a world tour is their cover as they pull heists at national museums and banks located right next door to national theaters in Berlin, Madrid and Dublin. It’s a globetrotting puzzle quest similar to Disney’s National Treasure series. It’s a fun ride around Europe, but the humor is mostly derived from American stereotypes of European ways and cultures. There is reason to be a little cynical about the storyline; its international scope is no doubt a play for appealing to a global audience more than ever before (at one point, Gonzo manages to inflate a soccer ball - as in futbol - out of his trumpet), but how well that humor plays in Siberia, Madrid, Paris and elsewhere remains to be seen. Once again, it’s old-school Muppet humor. Even so, the Muppets still need to be handled with care. Given Disney’s masterful marketing savvy, enormous bank account and ownership of ABC (the television network, not the alphabet), things like the Muppets co-hosting Good Morning America (including a cooking segment with the Swedish chef) happen. There’s even a conspiracy theory that suggests John Travolta intentionally mangled Idina Menzel’s name when he introduced her performance of Let It Go (from Disney’s Frozen) at the Oscars (which were broadcast on ABC). Theory. Rumor. Entertaining food for thought. It’s also a little scary. The crass commercialism of the Muppets in the run-up to the release of Muppets Most Wanted is an unwelcome aspect of the multimedia giant’s ownership. At least the end product still fulfill’s Kermit’s lifelong ambition of making millions of people happy.